It feels somewhat appropriate that I'm finally finding time to sit down and post about Christmas on this here 12th day of Christmas. According to tradition I guess we are supposed to be taking the tree and wreaths down tonight and having a bonfire. That actually sounds like a pretty good idea....maybe next year. We do intend to take the decorations down this week but first we have to tackle the dining room table Christmas Pile. What's the Christmas Pile? Well, it's a tad bit of everything, I guess. Our dining room table is notoriously our Dump Zone and while we had been doing a pretty good job of keeping it clean in the days leading up to Christmas all of that changed once Christmas was actually here. Most of it's gifts from our various celebrations that made their way out of the car and into the house, just not very far into the house. I want to put stuff away but every time I go to pick something up and find a home for it I find myself wanting to clean that home first. Which is why we have been knee deep in cleaning our pantry the last few days. In addition to the pantry I have also started cleaning our bedroom, the bathrooms, and the basement. They are all in various stages of clean and I need to stop jumping from one task to another and just finish something already! Anyway! Christmas! It was really great. Every year it goes by fast and this year was no exception. I told myself I would not get sucked into the Christmas Stress but in the last few days I succumbed. I had to finally take some things off the to-do list because there just wasn't enough time to get it all done, which is why my Christmas cards just went into the mail this week. ::sigh:: But you know what? Christmas was still wonderful even if everything didn't get gone. We spent Christmas Eve with Collin's family and finally, finally! got to meet our new baby niece who is now 9 months old. She was as cute and wonderful as expected and I can't wait to get my hands on her giggly little self again. Unlike my children she is not afraid to go to strangers and I am so glad for that! "Sons of B*tches, Bumpuses!" I can not watch this without cracking up! Before we knew it the sun had set and it was time to head to bed, the day went too fast. On Saturday after Christmas we headed down to Illinois for the extended Bender Family Christmas at my aunt and uncles and then down to my parents' house for our family Christmas with my brother and sister-in-law and niece and nephew. The kids stayed up way too late but it didn't even matter we were having such a good time. Every child was thrilled with their gifts and it was really fun to see all of their faces light up. We had intended to stay down there until Monday but on Sunday evening we realized the Winter Storm that was rolling in was going to make travel on Monday difficult and dangerous so late Sunday we packed up and hit the road around 9 pm and pulled in here at home in the wee hours of the morning. And just like that our Christmas celebrations were over. Although our decorations are still up and I had really good intentions of really celebrating these 12 days of Christmas all things Christmas have kind of fizzled over the last week and it just dawned on me on Sunday that the Christmas carols are over for the year.... and that realization made me sad. But here's to 2016! A new year! New adventures! I think I'm ready to dive in but first we have the Epiphany to celebrate tomorrow and then, THEN we'll dive in. Hope you all had a blessed Christmas and on this last day of the season, from our family to yours, Merry Christmas! 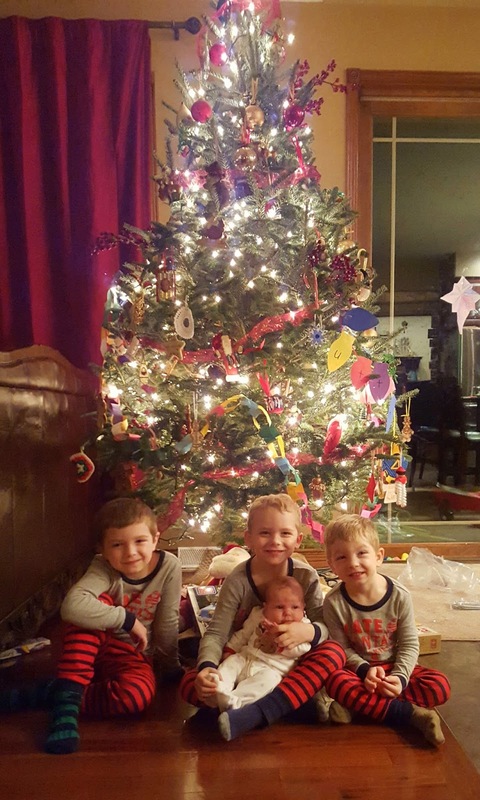 Love the picture of the kiddos in front of the tree! (And who is that big boy on the right?!! I hardly recognize him...he is getting SOO big!! Glad you had a wonderful Christmas!